Save 65,- Euros with our anniversary special! 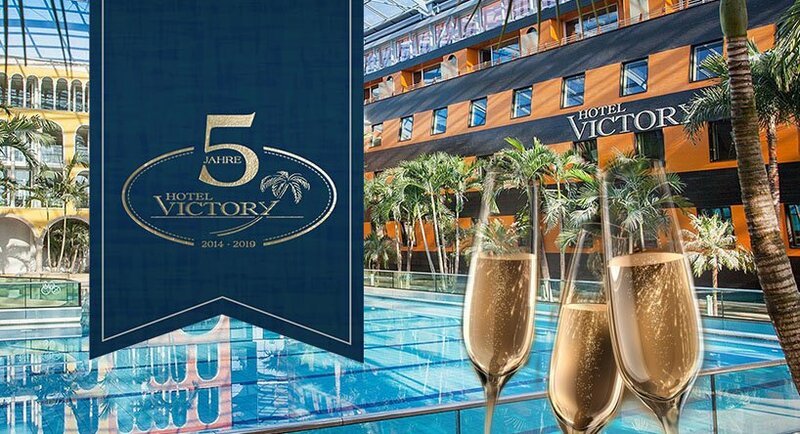 Come aboard the Hotel Victory and enjoy a 3-day break from 28.04 to 07.07.2019 at the Therme Erding. 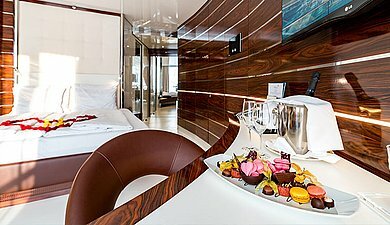 With our anniversary offer you save 65,- Euro compared to a regular booking. Weigh yourself in the 34° warm thermal water in our wavepool among real palm trees, let the Crazy River drift you into the outdoor pool and enjoy the wonderful weather with a cocktail at the pool bar. The spacious outdoor garden invites you to relax or enjoy an action-packed day on our Galaxy Erding summer slides. 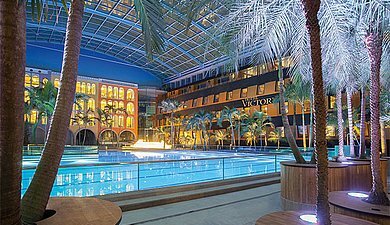 All wellness lovers will find more than 30 saunas and steam baths in the Therme Erding as well as a free daily program with more than 100 daily activities. With our anniversary offer* you can experience special pampering moments for two or with the whole family in the Hotel Victory Therme Erding and save up to 85,- Euro per double room. Entrance to the textile areas of the Therme Erding (Therme incl. wavepool & Galaxy slide world) is included for your entire stay. Admission to the VitalityOasis and Spa Area & Saunas can be booked on site. * This offer is only valid for the travel period 28.04.2019 to 07.07.2019. Bookable subject to availability and on request only until 28.04.2019.